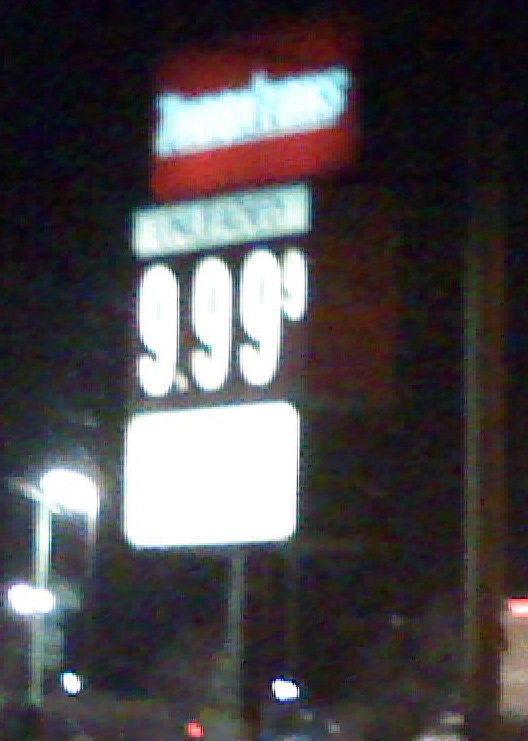 I doubt that it’s the same price on the pumps, but the sign at the station does say $9.999 a gallon. The station’s sister station, 2 miles away, has regular unleaded and diesel at $2.759 and we actually purchased some this evening at a different station a few miles away for 2.649 per gallon. I think that there was something wrong with this electronic sign, but it does make it look more and more like the Second Coming of the Carter Administration. More every day! Oh, and there were cars at the pumps even though the advertised price was so high. For an emergency bill why is most of the “spending” set for years in the future? If it’s in the future, then why does it need to be in this “emergency” bill? See what happened in Kentucky (and is still happening) and see what’s happened before in many different areas of the country, a good choice for infrastructure spending would be on upgrading the electric grid. Get the lines underground. I think it was the summer of 2003 when a squirrel on an electric line disprupted power to nearly the entire eastern seaboard. Getting the lines underground will protect them from weather, ice storms, tornados, etc. As a side benefit, getting the electric (and telephone and cable) lines underground will remove an eyesore and will save trees. How many times have you seen a tree that’s been utterly butchered to remove branches that may endanger lines? We also need an upgraded electric grid to cover all the plug-in electric vehicles that we’re all supposed to buy. The current grid can barely handle the capacity it needs to now, let alone when all these electric cars are sitting in our driveways. Rolling blackouts, anyone? Any new or rebuilt road contracts should include trenching for utilities where poles are. And for all these “shovel ready” projects: we have to guarantee that they aren’t “Big Digs” and that they are “St. Anthony Falls Bridge Rebuilds”. On a road near where I live, all last summer was spent completely tearing up the road in the eastbound lanes and rebuilding it. In the fall, before construction was suspended for the winter, the east bound lanes were ready for travel, and they closed off the middle so eastbound is on brand new 18 inch thick concrete and westbound is still on 8-11 year old rebuilt concrete with massive asphalt patches. If they’d put fly ash, a byproduct of coal power production, into the concrete mix, the road could last for 5 decades or more. That would decrease construction delays, decrease pollution from vehicles, save people time, and put a byproduct of coal power production to good use – another decrease in pollution. And think of the savings in taxpayer money if the road doesn’t have to be completely rebuilt every few years. Generating public sector (government) jobs will not grow wealth or the economy. Only private sector jobs can do that. Public sector jobs don’t create anything. There is no manufacturing, no sales. Sure they consume a lot of stuff. But what do they show for it? Government can encourage or discourage the private sector. At the moment they are discouraging the private sector. Government wants to increase entitlements and increase government jobs. But if everyone is on the goverment teat with entitlements or employment, where does the money come from? Will government pay it’s employees with one hand and take from them with the other to pay the entitlements? Wealth is not a zero sum affair. There isn’t only so much wealth around and no more. Business creates wealth. But they can’t create wealth if government taxes eat up too much. If there’s a de facto penalty for creating more profit, creating wealth. It will end up that all the money flows from and to the government and that will be a zero sum affair. With government in charge it does mean that some will have to have a smaller piece of the pie in order for someone else to have a larger piece, or a piece at all. With business creating wealth, it’s easy to just make more pie. This administration has just gotten its beloved SCHIP expansion passed. The administration is going to pay for this by increasing the federal cigarette tax. Many adults in the families that SCHIP is supposed to help the most are smokers. So, government is paying for the expansion of SCHIP with taxes on a product used by people in families SCHIP is supposed to help. Then too, an increase in the cigarette tax will encourage many people to quit so as to avoid the added expense. Thereby reducing the revenue stream just as expenses for SCHIP will be inevitably increasing. Many will drop private insurance in order to take advantage of SCHIP. Why pay for something when you can get it for free? Where do Obama’s higher taxes hit? And why $200,000 for an individual, but $250,000 for a couple? Where’s the fairness in that? That’s the number given by Maria Cardona of the Obama campaign when asked by Julie Banderas if the $250K was net or gross. Maria Cardona continues to insist that 98% of small businesses make less than this. But she’s talking gross numbers here. Does she or the Obama campaign realise how many small businesses can GROSS a quarter million dollars a year? Easily? Say you have a small retail establishment. You may have a couple of employees. Maybe at $12/hour. That’s $48,000 just for regular time, 40 hours a week, 50 weeks a year. Then add in $4,131 for the employer’s portion of FICA (social security and medicare), add in unemployment taxes and any benefits you might be paying. That $48,000 in salary can become $62,000 when all is said and done. So far, with just rent and two employees we are up to $89,000. Then we have insurance, advertising, shipping, inventory, licenses and other business fees, local taxes, inventory losses, perhaps franchise fees (depending on the business), and a myriad of other expenses. And you want to pay yourself something. You also want to be able to reinvest something into the business. With good sales, or a service that’s in demand; business to business or business to consumer or both, I would say the number of small businesses that can gross $250K or more in any year is far in excess of only 2% of small businesses. One point of discussion was death or estate taxes. The Fox person asked the democrat about death taxes and the democrat said they must stay and even increase. The Fox person mentioned that money inherited is money that has already been taxed. We can’t allow people to accumulate wealth and then pass it to their heirs. And there you have it, the main difference between democrats and republicans. Republicans say more power to you – accumulating wealth to pass on to your heirs. The democrats don’t want you keep your own money or give it to your own family. You can accumulate wealth, but only to give to the government so they can redistribute the wealth that you worked so hard to accumulate.